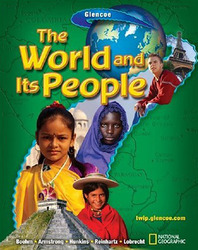 An all-new middle school program co-authored by National Geographic, The World and Its People introduces students to an enriched view of the interrelationships of geography, history, economics, government, citizenship, and current events - in one compelling package. Connect your students with their world through in-depth coverage of major contemporary issues with TIME Magazine using stories, activities, and highlights. Ensure reading success with a wealth of features. Built-in, research-based active reading strategies enable students of every ability level to read, learn, and understand the content.